Reckless characters and horrific bullying ruin this novel. 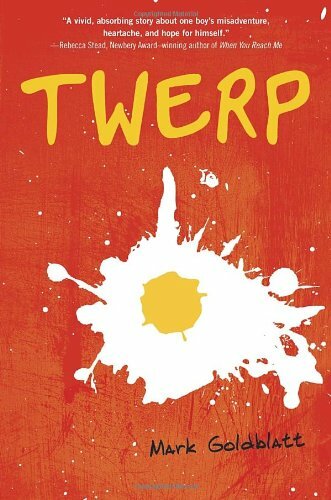 Sixth grader Julian "Twerp" Twerski writes a journal for his English teacher about the big events of his life that year, including meeting his first girlfriend; his friends from the New York neighborhood; a kid who runs as fast as he; and, most importantly, the bullying incident that got him and his friends suspended. Disappointing morals: Julian and his gang are obnoxious, careless, and irresponsible kids who cause mayhem throughout their neighborhood. It was especially aggravating to me that Julian would describe what he and his friends did, and then write "it was dumb" and then move on - realizing you did something wrong in no way means taking responsibility for it. The gang badly bruises and breaks the teeth of a mentally handicapped kid. And again, Julian simply writes the the all-too-casual "it was wrong" in the journal. Julian and his friends are Jewish and talk often about Hebrew school and the bar mitzvah. Julian gets mad at God along with everyone else at points in the story. It's revealed at the end what the gang did to Danley: they pelted him with nearly frozen eggs until his face was blue and bloody. Then Julian chucked an egg "as hard as [he] could" at Danley and broke his teeth. Grown-ups drink beer. It's implied the gang has tried beer too. Jillian, Julian's girlfriend, has a mom whom people describe as a tease. At a barbecue, she lies tanning with nothing on but underwear. This book, which I checked out from the library for pleasure reading, instead made me angry. I felt so bad for Danley primarily, but the kids don't learn from their mistakes. Throughout the book, they chuck stones at animals, jaywalk, lie to one another, and get in fights. I felt like the author's tone was one of "boys will be boys," and that is a dangerous philosophy for a reader around the gang's age (12) to read and emulate.